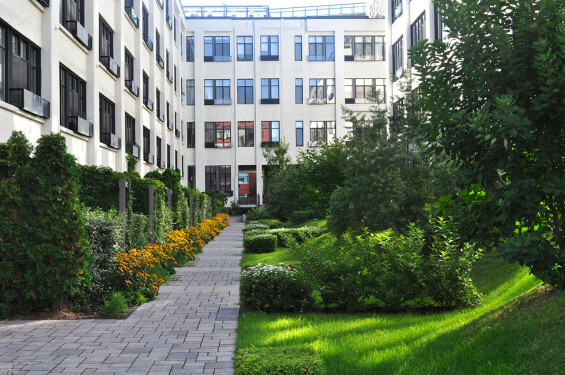 The transformation of the former Imperial Tobacco Factory site into a progressive urban residential complex is innovative on several fronts: it combines affordability with sustainable practices and the preservation of industrial heritage fabric; building reuse with a unique approach to shared space; and the regeneration of hardscape environments into sustainable ecosystems that incorporate public and private residential spaces. Reinvestment in vacant industrial sites is the first step toward sustainable redevelopment of our cities. 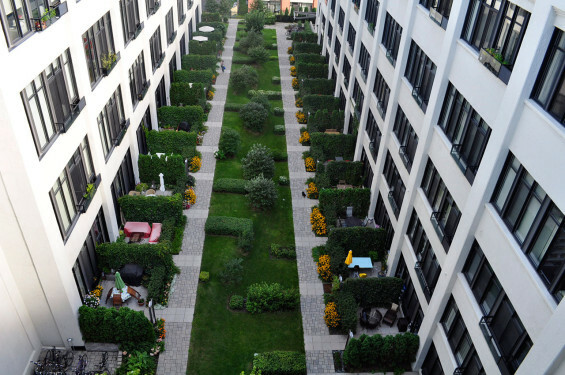 By transforming the Imperial into a residential complex, the area’s density and environmental quality are improved. 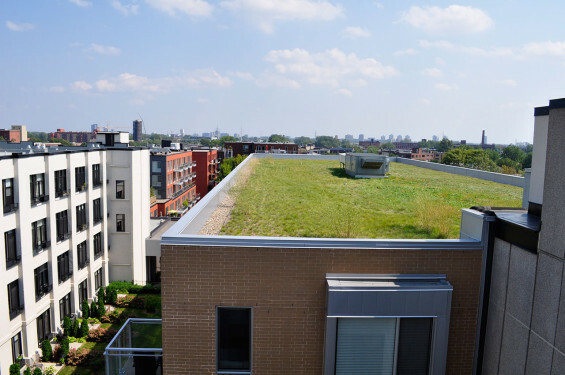 An innovative yet affordable project, it targets young Montrealers supportive of its sustainable practices such as green roofs, car-sharing, rainwater recycling, and energy efficiency. 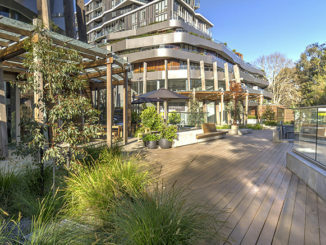 Courtyard and garden landscape replace surface parking, while new permeable surfaces permit on-site rainwater retention. In fact, reservoirs once used in the tobacco production process are now employed for irrigation of site plantings. 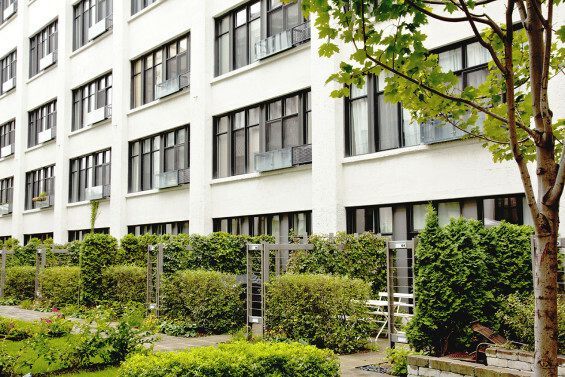 With the removal of its monolithic 1960’s exterior envelope, the Imperial’s value was rediscovered. 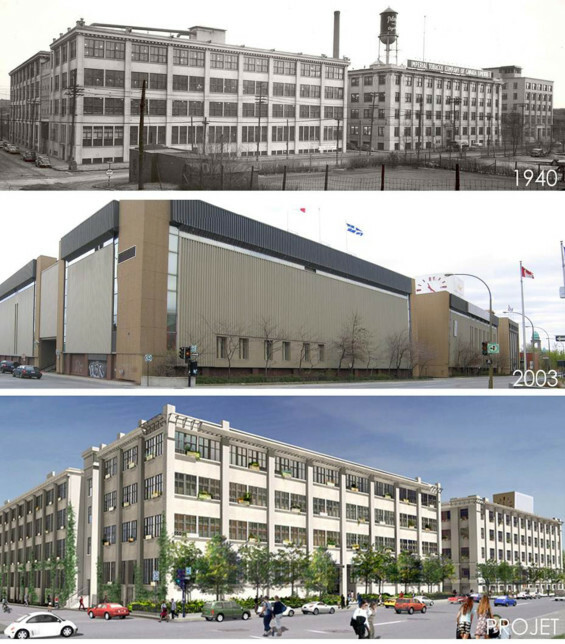 Its original large-windowed facades testify to a rational and elegant architecture that responded to the functional needs of an early 20th century cigarette factory while its rooftop clock tower connected it to the broader community. To share the Imperial’s history and former vocation, the design references the form of the cigarette. Reimagined today, this form becomes an oasis of fresh air located at the heart of the old factory site. 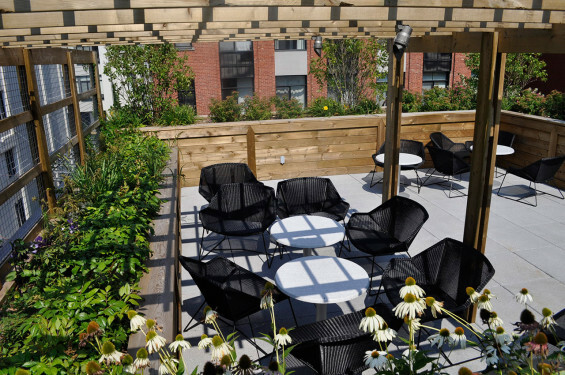 Covered walkways lead in from the street providing views toward the site’s interior. The factory’s asphalt surfaces, once urban heat islands, are replaced by cooling landscaped courtyards animated by a rhythm of offset linear hedges – cigarettes – woven through with plantings representing wafts of smoke. This structure permits an intermingling of public, semi-public and private through the insertion of walkways, screens, gardens and terraces. 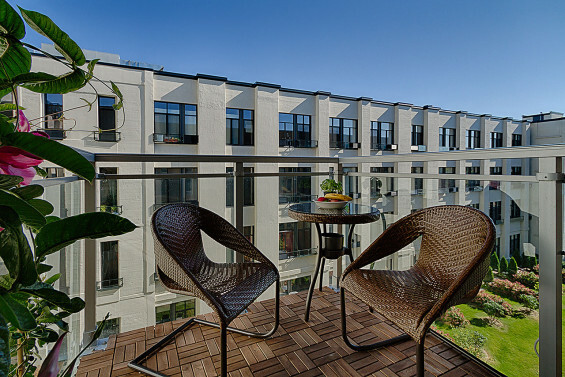 At the roof level, landscaped terraces and their prized views are provided for the use of all residents, encouraging social interaction, and compensating for the small living areas within units. The terraces include pools, BBQ areas, a fitness centre and two urban chalets, one of which is housed within the Imperial Clock’s armature. Conceived as a lounge, it extends out into the rooftop landscape and offers panoramic views of the city, reinforcing the project’s dynamism and parity, while its illuminated dial creates a night-time neighbourhood beacon. 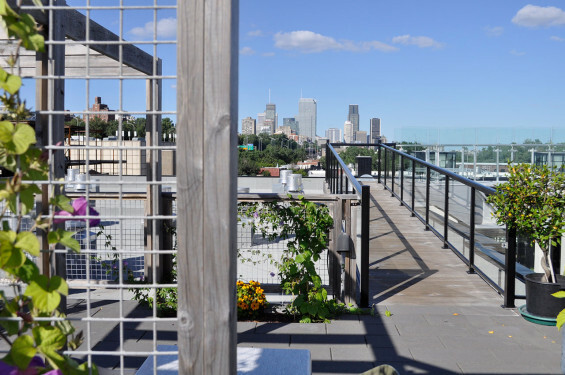 Beyond the simple execution of a program, our practice of landscape architecture proposes a marriage of exploration and practice; it speaks to our goals of nourishing the sense of the city, making it readable, understandable and livable. The Imperial is the result of collaboration between professionals and developer, where the goal of urban integration is consistent with responsible feasibility analysis and socio-economic optimization of projects. 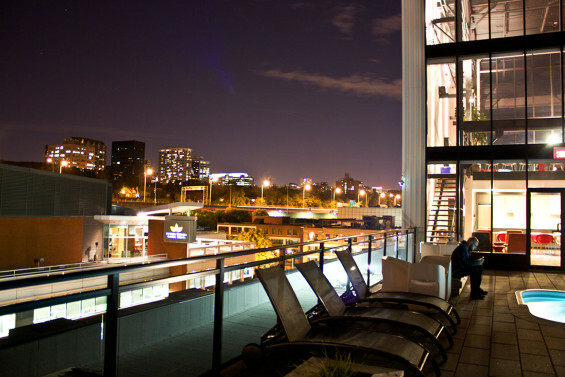 With minimum budget it revives an environment, integrates a new residential paradigm, and celebrates a vibrant past. 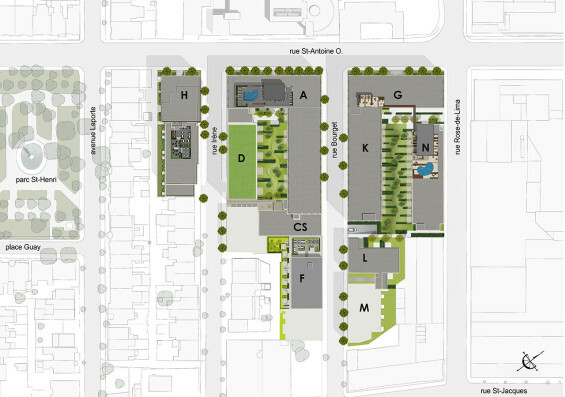 The magnitude and thoughtfulness of its interventions permit the redefinition of the neighbourhood without marring established populations, supporting an authentic process of reappropriation and regeneration.